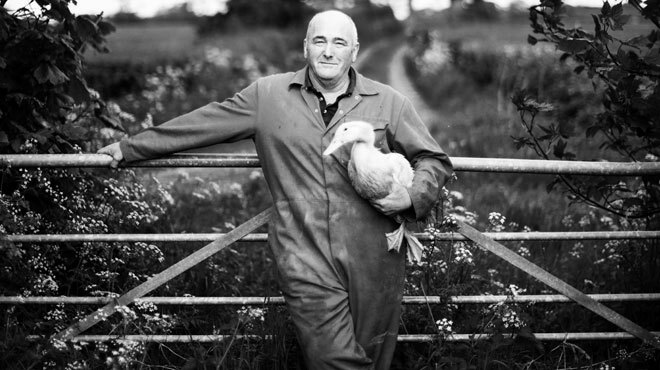 Reg Johnson, iconic Lancastrian producer and friend of Booths has recently passed away. Our thoughts are with his family. He was a much loved supplier of Booths, and here is his story. The first time Reg Johnson tried one of his own wheat-fed guinea fowls he loved it so much, he hid it. He did it so that he could come back to it later to make sure it really was that tasty. And so that he could polish it off all by himself: ‘I was being greedy,’ he admits. They’re one of the only farm in the country that grow and mix the food for their animals on their own land. This is the farm where the birds live in small flocks with twice the amount of recommended living space. It’s the farm where the animals are never in a vehicle for longer than nine minutes. Where they’re dry-plucked for a crispier skin and hung to develop their flavour. This is the only farm to produce Goosnargh birds, one of Lancashire’s best-loved exports.